Located in Uttar Pradesh (India), we are a notable Purchases & Sale of Acetylene Gas. The Acetylene Gas that we make available is widely used for oxyacetylene welding, cutting and heat treating. Owing to purity, effectiveness and reliability, our Acetylene is widely demanded. Talk of price; we are known for providing the best quality at rock bottom prices. Acetylene (C2H2) is known as one of the simplest and most significant chemical in the acetylene series. A compound of carbon and hydrogen, acetylene is a colorless, highly flammable gas that dissociates at normal to low pressures and needs to be stored in high-pressure tanks containing some porous material and acetone. It has active chemical property; it is easy to polymerize, synthesize and cause chemical reactions. Acetylene is the most common gas used for fueling cutting torches in both general industry and the mining industry. When mixed with pure oxygen in a cutting torch assembly, an acetylene flame can theoretically reach over 5700°F. Users of this type of equipment are generally familiar with the fire hazards associated hot flames and the production of hot slag. However, many users may not be aware of the unique characteristics of acetylene itself that create special hazards compared to other fuel gases. 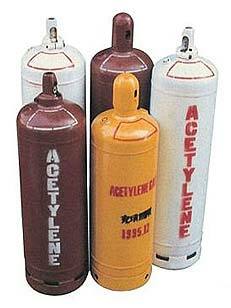 Acetylene has many commercial and technical applications. The most known application for acetylene is for oxyacetylene welding, cutting and heat treating. The majority of acetylene is use in the chemical synthesis process for the manufacturing of many organic compounds such as acetaldehyde and acetic acid. The Indian industrial gases market is dominated by oxygen. Oxygen accounts for nearly 75% of total production of gases outside carbon dioxide in the merchant market. If the captive segment is included, oxygen enjoys an over 70% share in all gases (outside carbon dioxide). The gas industry in India has a large number of small plants spread all over the country. Also there are tonnage plants of global standards and capacity, which are set up in different parts of the country. Many fertilizer plants have created the facility to tap Argon through purge gas recovery units and some are also purifying the flu gas to produce carbon dioxide. It is used in welding works etc.